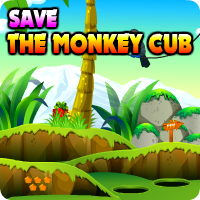 AvmGames - Avm Save The Monkey Cub is another point and click escape game developed by Avm Games. Monkeys are one of the trickiest animals on the planet at the same time, they are the sweetest. It's so bizarre that you have pet monkey while others have dogs. However, you don't want to treat him as a house pet. You don't want him to be in a cage. In fact, you let him roam around the forest as long as he wants to. This is the kind of relationship you have with your monkey that's why he also loves you so much. Every morning, you go to the forest to feed him. You were walking along the forest with a banana on your hand when you saw something. You saw a cage inside the forest but what shocked you is the fact that your pet monkey is inside. Beside from that, the cage has a lock. You don't know who did this but one thing is for sure, you have to let him out of the cage. Your monkey looks so worried so you have to find the quickest way to help him to escape. Go around the forest if you have to and collect objects that you can use to solve this puzzle. Good luck and have fun! is there any clue for pressing mushrooms or just trial and error? get rid of the damn ads in game..
Don't miss the 2 holes in the ground hidden behind Walkthrough button in S2. Out. Thanks for the game!